The Christmas Rose has a legend all its own among the many miracles surrounding Christmas. 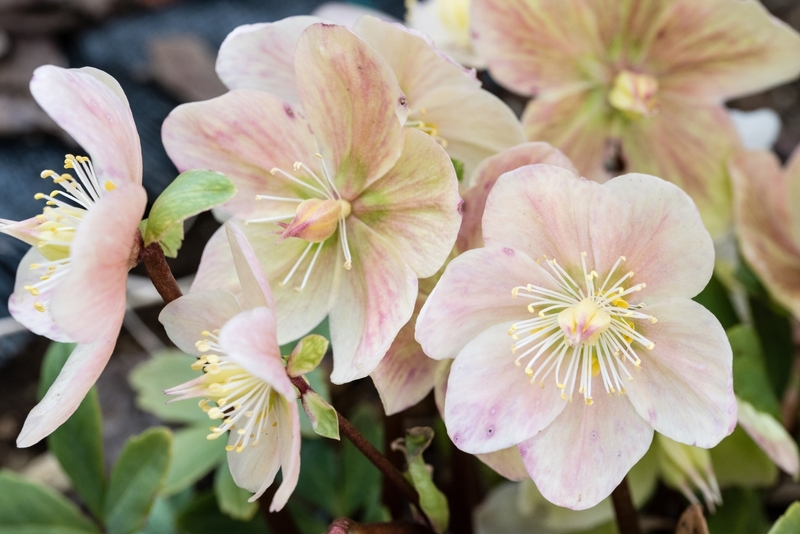 Though many stories are told with the spirit of this holiday season, the little story about the Christmas Rose has become a symbol of love, hope and everything beautiful. Legend has it that one very cold day after the birth of Christ, everyone came bearing gifts to see the newborn Savior. One day among the people were three distinguished wise men, the Three Magi, who were bowed down in silence as they worshiped next to the infant. A young shepherdess named Madelon reached the stable and as she stood in the doorway, watched the wise men as they stood up and placed their valuable gifts of myrrh, frankincense and gold next to the infant Jesus. Many others had brought gifts of fruit, honey and doves and Madelon felt powerless as she had no gifts to give. She wept quietly as she stared at all the rich and beautiful gifts at the foot of the manger. As a poor shepherd girl, she loved the beauty of nature while tending her flock and had wanted to bring flowers as a gift. But during her search earlier all over the countryside, she could not find a single bloom in the cold of winter. The Christmas rose only blooms during the winter months. An angel stood next to her and knew of her unsuccessful search for her precious gift. As he felt her sorrow, he gently brushed the snow aside at her feet. As her tears fell to the ground, a beautiful bush of white winter flowers sprang up around her feet. He then whispered into her ear these roses born from pure love are more valuable than any of the gifts from the Magi. A smile grew on her face when she heard those words. She joyfully selected the most beautiful blooms and presented the gift to the Holy Infant who smiled at Madelon, for the gift of the Christmas Rose was truly given from both heart and soul. 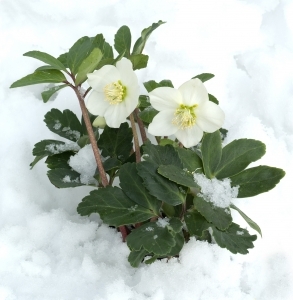 The Christmas Rose, Helleborus niger, is also known as “Snow Rose” or “Winter Rose” and in Europe it is considered one of the most traditional and noble seasonal plants of Christmas time due to its blooming in the middle of winter. In its native habitat it blooms from December through April, and like the Poinsettia, all parts of the plant can be poisonous when large amounts are consumed. Therefore it should be kept out of reach of pets and young children. The Christmas Rose is not actually a rose at all but a perennial herb where five-petal saucer-shaped flowers each grace the end of a stem. The flowers are found in various colors and do not carry a fragrance nor do well placed in a vase as a cut arrangement. To show off the flowers, cut the flowers without the stems and float them in a shallow bowl of water for a beautiful display of what Christmas is all about, the selfless giving of love.